For Captain Sullenberger, it was like 10,000 other days until it wasn’t. Whether it was a miracle or not, Captain Sullenberger epitomized being adaptable, nimble, and effective when things went wrong. Pilots train for all number of worst case scenarios. They are trained to remain calm and make fast decisions. Captain Sullenberger remained calm and acted quickly when things went wrong. Watch this simulation of the flight with the audio recording from the flight. First Officer Skiles had piloted the flight take off. 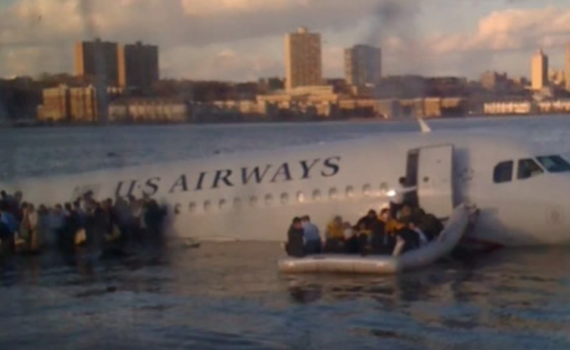 [vi] As the engines failed, Captain Sullenberger took over the aircraft. “My aircraft,” Sullenberger said. “Your aircraft,” Skiles replied. [vii] He was calm and wasted no time getting to work. Air traffic controller: Cactus 15-29, if we can get it to you, do you want to try to land runway 1-3? Sullenberger: We’re unable, we may end up in the Hudson. [Several seconds later] Air traffic controller: Alright Cactus 15-49, it’s going to be left traffic to runway 3 – 1. Air traffic controller: Okay, what do you need to land? Air traffic controller: Cactus 15-49, runway four is available if you want to make left traffic to runway four. Sullnberger: I am not sure if we can make any runway. Oh, what’s over to our right? Anything in New Jersey? Maybe Teterboro? Air Traffic controller: Do you want to try and go to Teterboro? [After confirming runway in Teterboro] Air traffic controller: Cactus 15-29, turn right 2-8-0. You can land runway one at Teterboro. Sullenberger: We can’t do it. Air traffic controller: Okay, which runway would you like at Teterboro? Sullenberger: We’re gonna be in the Hudson. Air traffic controller: I’m sorry, say again Cactus. With his range of experience, and his ability to adapt to changing circumstances and make decisions quickly and effectively, he was able to pull off a miracle on the Hudson. We never know when that day will come that starts like 10,000 other days and then suddenly isn’t. We never know what day we as individuals or organizations will face some ultimate test – one that could decide our fate. One of the disciples of leadership is the ability to adapt quickly and effectively when things go wrong. But so often that does not happen – too often leaders and organizations do not respond to changing circumstances in timely and effective ways, and it causes significant harm to the organization and its leader. To maintain the trust and confidence of those who matter most, leaders need to overcome the fear and inertia that stalls decision-making when things go wrong. Leaders need to take what they know, adapt to the current circumstances, and quickly and effectively make a decision as to what to do next. Captain Sullenberger is trained to handle whatever happens – no matter how unexpected or unanticipated. His job that day in January 2009 was to be nimble, adaptable, and effective when things went wrong. He had the discipline to carry out this principle, and as a result everyone on board that flight disembarked the plane and went on to fly again. The burden for leaders is develop this discipline so that should that day come that is like 10,000 other days until isn’t, they will be able to respond in a nimble, adaptable, and effective way. [i] Newsweek Special Edition. “‘Sully’ Sullenberger Remembers the Miracle on the Hudson.” Newsweek. Newsweek, LLC, 11 July 2015. Web. <www.newsweek.com/miracle-hudson-343489>. [ii] Brooks, Mike, Mike Ahlers, and Jeanne Meserve. “Airplane Crash-lands into Hudson River; All aboard Are Reported Safe.” CNN. Cable News Network, 15 Jan. 2009. Web. <http://www.cnn.com/2009/US/01/15/new.york.plane.crash/>. [iii] Wald, Matthew L. “Plane Crew Is Credited for Nimble Reaction.” The New York Times. The New York Times, 15 Jan. 2009. Web. <http://www.nytimes.com/2009/01/16/nyregion/16pilot.html?_r=0>. [v] Brooks, Ahlers, and Meserve. [vii] “US Airways 1549 CVR Transcript.” US Airways 1549 CVR Transcript. Cockpit Voice Recorder Database, n.d. Web. <http://www.tailstrike.com/150109.htm>. [xi] Brooks, Ahlers, and Meserve. [xiv] Hoskinson, Jim, dir. “The Late Show with Stephen Colbert 9/7/16.” The Late Show with Stephen Colbert. CBS. New York, New York, 7 Sept. 2016. CBS. Web. <http://www.cbs.com/shows/the-late-show-with-stephen-colbert/video/7uZarYH2NFC95De08VneYldyKdMGifFt/the-late-show-9-7-2016-whoopi-goldberg-regina-hall-captain-sully-sullenberger-/>.